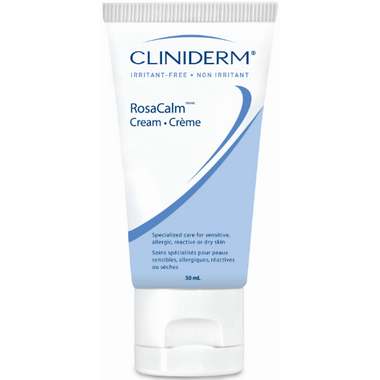 Cliniderm RosaCalm Cream soothes irritated and dry skin associated with rosacea-prone skin, r and educes the appearance of redness and skin imperfections. Once applied to skin it is quickly absorbed. Directions: Apply 2 times daily or in combination with RosaCalm 30 cream. CLINIDERM products are formulated without parabens, dyes, perfume, lanolin, formaldehyde or proteins. This cream is definitely not for me. It actually makes my rosacea worse! As soon as I apply it, my skin turns beet red and soon after it becomes irritated and itchy. I see that some people have good results, but that's not the case for me, unfortunately. Also, I know it's 'fragrance free', but the scent of the ingredients is hideous and it lingers. I wish I would have had better results. Just ok for me. For reference, I have rosacea and severely dehydrated skin, particularly in the colder months. This cream is very fluid, which is fine as it does absorb quickly, but it doesn't moisturize enough for my needs nor has it done much to reduce redness. In fairness, I have not used it with the RosaCalm 30. THIS CREAM WAS RECOMMENDED TO ME BY MY PHARMACIST AS I HAVE ROSACEA. I FIND IT VERY EFFECTIVE. IT IS FRAGRANCE-FREE, WHICH I NEED GIVEN MY EYE CONDITIONS. Good for sensitive skin, has no perfume or scent even. My only gripe is it leaves my skin shiny.